I took I-CAR up on its offer to “audit” the introductory course of its new Production Management “major” announced this summer — its first new professional development program in years. Imagine my surprise — PM101’s not directly about that specific managerial job. Instead, the PDP starts out even broader, to teach production managers a core lesson about the kind of shop they should want to be managing. Without a “learning culture” foundation driving the shop and being fostered by the manager, the business will never reach its potential, I-CAR argues. 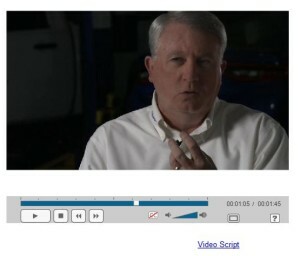 Knowledge is an asset which must be managed, “just like a welder, equipment,” former I-CAR segment development senior director Jeff Peevy says in the series of video lessons. Collision repairers seeking best practices for managing their own or others’ work should check out “Getting Paid for Investing in Facility, Equipment and Training” with Tim Ronak, AkzoNobel; “Scheduling and Work in Progress (WIP)” with Tom Hoerner, BASF; “The Lean Office – Organizing the Shop Office for Maximum Efficiency” with Judy Lynch, Sherwin-Williams; “In-Process Quality Assurance” and Process Driven Collision Repair with Lee Rush, Sherwin-Williams; or “Our Journey to Become a “Successful” Collision Center” with Craig Seelinger, BASF. The presentations will be at this year’s SEMA Show as part of the Society of Collision Repair Specialists’ Repairer Driven Education series. Register here. Peevy says success meant land and resources in older times, capital access to build factories in the industrial revolution and 20th Century, and labor in a knowledge economy. “Knowledge has displaced capital as the key to success,” the I-CAR narrator states. The theory holds that it’s how well a shop’s employees are trained — and embrace that idea — that matters. Production managers who apologize to staffers for having to send them off to training — that’s just bad business. “That’s the best way to ensure that you’ll get little to no return investment for that training,” Peevy says. A company encouraging its employees to grow professionally and share information with one another will see lower turnover and have better results. It’s an intriguing hypothesis backed by data I-CAR presented in 2013. Shops which embraced a learning culture cut cycle time by 28.9 percent and supplement frequency by 12.5 percent after I-CAR gave them some refreshers, and they dramatically grew touch time (up 49.2 percent) and customer satisfaction (6 percent) as well. A shop which saw training as a requirement improved with I-CAR’s supplements — but only a little. Cycle time dropped 3.6 percent, and supplement frequency fell 10 percent, but touch time and customer sasfaction both grew less than 2 percent. 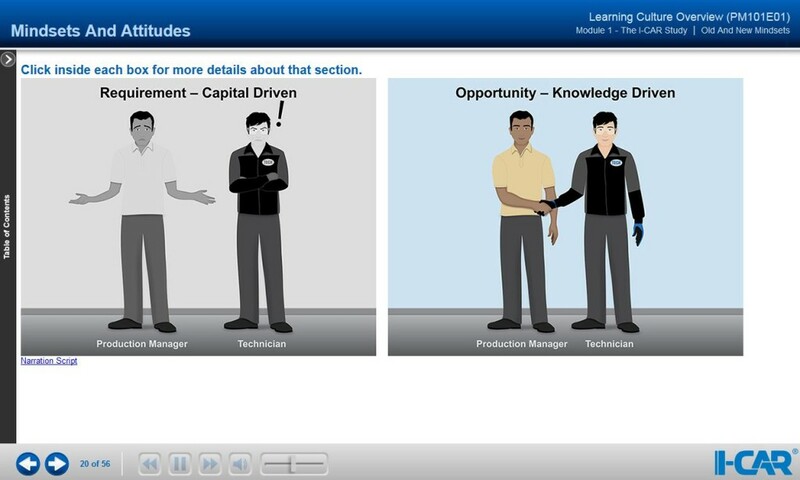 “It (the learning culture) actually maximizes everything a repair facility does,” I-CAR’s narrator states. I’m not going to give any more away — you’ve got to take and pass the course yourself, after all. For those who do, it might provide an interesting business theory for both the shop and economy-wide level. Also, it encourages reading industry trade news. Just saying.